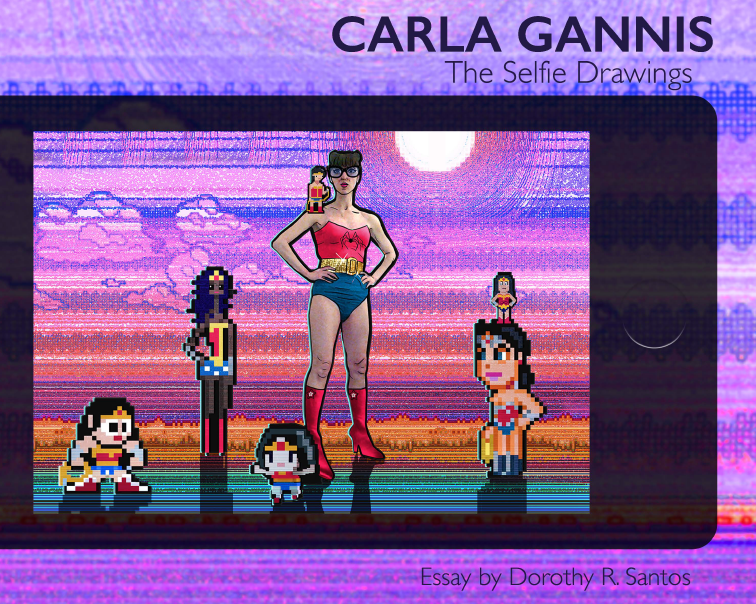 “The Selfie Drawings” is a collection of 52 digital drawings completed by artist Carla Gannis over 52 weeks, from January 2015 to December 2015, and including a critical essay on the work written by Dorothy R. Santos. This hardcover, limited edition art catalog transcends the parameters of a physical book, as contained within it, released over the period of a year, will be 52 augmented reality experiences. In collaboration with UNBOX’s #BehindTheFace project and Blippar AR technologies, Gannis produced a serialized augmented reality “book object.” Using the Blippar app, readers can hover over a static drawing, and an expanded animated version of the drawing will appear on their screens. TRANSFER is pleased to present ‘A Subject Self-Defined’ the gallery’s second solo exhibition with NYC-based artist Carla Gannis. ‘A Subject Self-Defined’ is a new body of work from Carla Gannis that addresses issues of branded identity; age and body estimation; catastrophe culture; and online agency via static, dynamic and interactive “selfie” imagery. The woman’s face has served as the muse of the male gaze throughout art history. Artists such as Artemisia Gentileschi, Frida Kahlo, and Cindy Sherman have subverted this idea of woman as figure, as a mere face, and as muse through self-portraiture. They called into question what happens when a woman turns the paintbrush and, in our contemporary times, the camera, to her own face. In ‘A Subject Self-Defined’, Carla Gannis provides the viewer with multiple vantage points that traverses various forms of self-portraiture and mixed-media methodologies. Her series converges a wide array of technologies – drawing, painting, animation, social media, and augmented reality – together to serve as the artist herself re-represents herself. “My selfie drawing series began one year ago as a search, turning my gaze upon myself (and my electronic devices) to see what I might find there. I felt vulnerable at first, speaking more directly through my own voice, and using myself as a character in the digital narratives that seem to be my most natural form of expression. A full inventory of work from ‘A Subject Self-Defined’ is available from the gallery. Please inquire with the director@transfergallery.com to request information. Carla Gannis identifies as a visual storyteller. With the use of 21st Century representational technologies she narrates through a “digital looking glass” where reflections on marginalization and agency emerge. She is fascinated by digital semiotics and the situation of identity in the blurring contexts of real and virtual. Since 2003 Gannis’s work has appeared in 20 solo exhibitions and numerous group exhibitions both nationally and internationally. Her 2015 solo exhibitions include “The Garden of Earthly Delights” both at Real Art Ways, Hartford, CT and at The Hudson River Museum, Yonkers, NY. Features on her work have appeared in ARTnews, The Creators Project, The Huffington Post, Wired, Buzzfeed, FastCo, Hyperallergic, Art F City, Art Critical, The Wallstreet Journal, The New York Times and The LA Times, among others. Gannis has also participated on numerous panels regarding the intersections between art, technology, and networked culture, including “Let’s Get Digital” at the Metropolitan Museum of Art and “Cogency in the Imaginarium” at Cooper Union and at the School of the Art Institute of Chicago. In April 2015 her speculative fiction was included in DEVOURING THE GREEN:: fear of a human planet: a cyborg / eco poetry anthology, published by Jaded Ibis Press. Gannis is a professor and the assistant chairperson of The Department of Digital Arts at Pratt Institute.